After over 40 years in the business Marten and his team get to hear a lot from clients about what they’re after from a service, which is why we see it as a priority to cater for as many of their needs as possible. 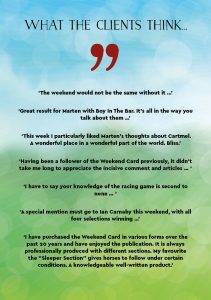 That is why we have decided to bring back the Weekend Card – our best-selling service for many years before we decided to give it a rest with a view to revamping it when we felt the time was right to embrace and engage with the new technology. One thing that has become clear is the importance of continuity in a service. For example, when we select a horse we know that our clients would appreciate some feedback – whether it wins or loses. 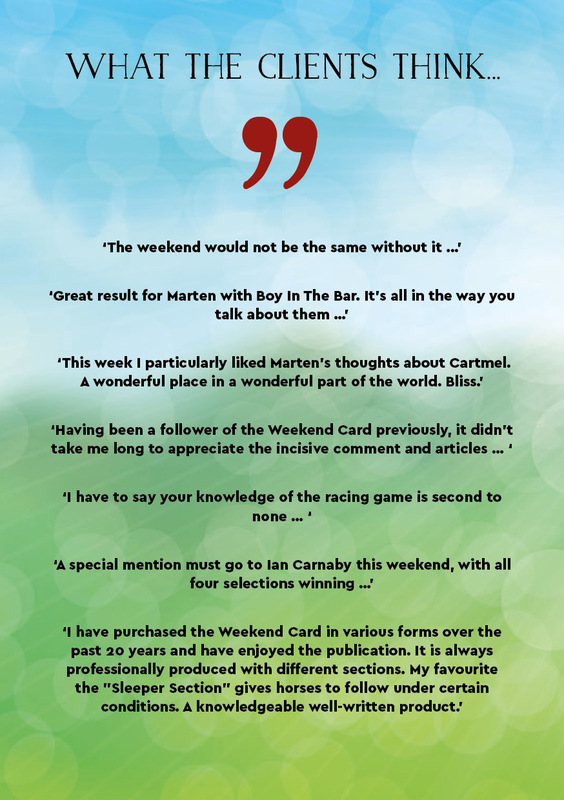 The Weekend Card prioritises this by providing weekly updates on key horses from Marten’s Dark Horses Annuals (both Flat and Jumps), as well as selected horses from earlier editions of the Weekend Card. All subscribers to the Weekend Card will receive a User’s Guide, written and edited by Marten and Rebecca. This explains in full detail both how to use the Weekend Card and also how to derive the most benefit from it. Marten guides you through the racing side of things, while Rebecca provides advice on the technology and administration – how to order, keep alerted to runners etc. In the past 24 months, most of the sections have yielded a profit to level stakes and a healthy return on turnover. We believe that the only fair way to assess any service is by recording and updating the returns to a one point level stake and also as a percentage return on investment. If you would like a full explanation of how these returns are calculated, or a complete list of results, then please contact Rebecca (rebeccca@martenjulian.com). July 2018 was the two year anniversary since the return of the Weekend Card and to celebrate we produced a special edition packed with additional features! It contained an article from Dave Nevison, Stu Williams, a speed figure article from Gary Spinks and a beautifully written article from Ian Carnaby. December 2018 we produced a Bumper Edition to provide Festive reading for our clients. It was very well-received and we are now considering offering four bumper editions a year. More to follow at the end of January on this. We have noticed that a number of clients are logging in each week and buying the Weekend Card every week. For this reason, we are now offering a Full Season Pass. This means a client only has to make one order and then we will upload the Weekend Card each week into that order. There is a saving to be made by ordering this package. We requested feedback from our clients and used this alongside our analysis on results and made some changes to the service. The Postscript feature was removed since this belongs to the Online Preview it is written about. Previous Weekend Action horses that Marten have selected will not automatically become selections in his Retrospective section. Marten will still write about the previous weekend’s runners in his Retrospective section but if they are a selection they will appear in his Weekend Action article. Below there are extracts from various editions with winning results. 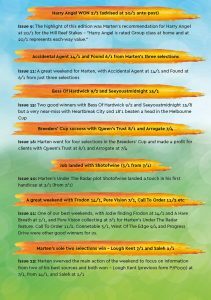 We know it’s not all about winners which is why we offer past samples so you can judge the publication for yourself. Clients I speak to tell me they look forward to a Thursday when they receive their email copy or to the hard copy arriving on a Friday/Saturday. We aim to offer long-term news and look back at Marten’s previous selections so we can learn from them and make notes for the future. “Finally, we come to the Grand National and One For Arthur, who I advised at 20/1 when the weights were published, comes here in good form according to his connections (5.15 Aintree Saturday). The eight-year-old has been my idea of a National horse from way back in December and I couldn’t have been happier when he won the Classic Handicap Chase at Warwick in January as it ensured that he would get into this race. He has all the right attributes you need – he’s a sound jumper, he stays well, he’s got a lovely racing weight and he has experience over the fences. 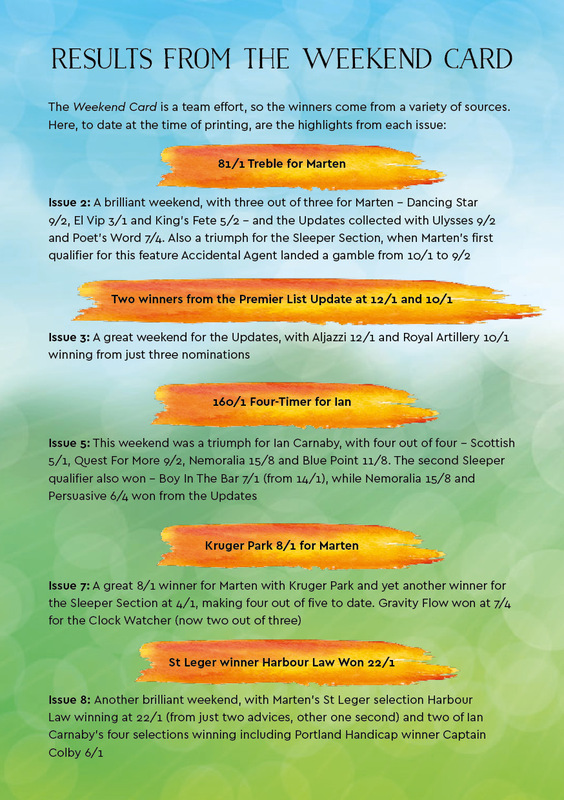 The Sleeper Section – by far and away the most popular feature of the Weekend Card, with Marten’s specially noted horses – a few dark ones, a few unexposed ones and a few unraced ones. The Clock Watcher – Marten has devised and now tried a system to identify horses that have put up exceptional performances on the clock. The Ante-Post Agenda – a brief weekly update on horses that Marten believes may warrant ante-post interest. Again there will be continuity of mention. Under The Radar – observations. Sometimes controversial, from Marten and Jodie on the sort of thing the pundits miss – or choose to avoid! Strange rides, non-racing betting opportunities and a bit of politics! 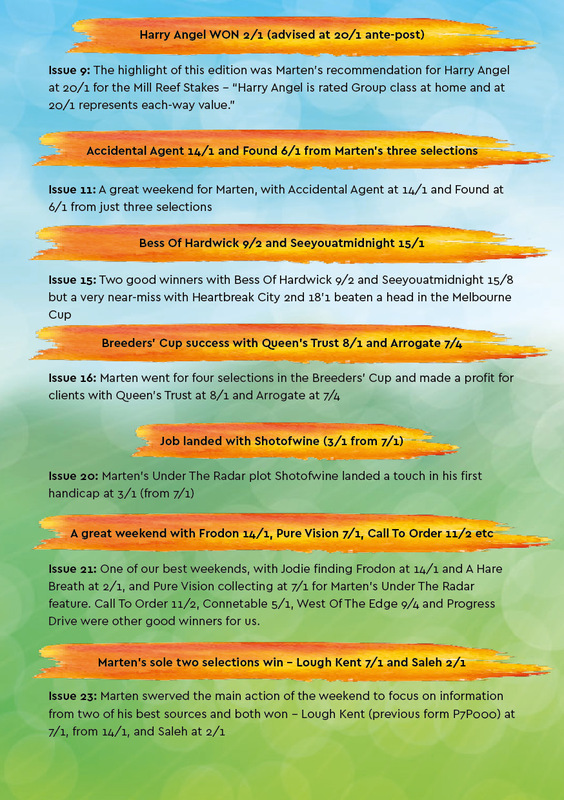 The Weekend Action – obviously the Weekend Card covers Marten’s thoughts on the big-race action at the weekend, together with horses that have caught his eye elsewhere. 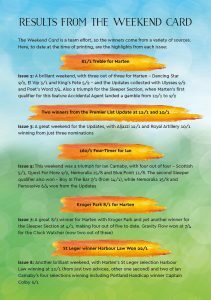 The Update – latest news and entries for horses that have featured in past Weekend Cards, the Dark Horses Annuals and the Postscript Service. Ian Carnaby – a great favourite of our clients and a big part of our team for many years. Jodie’s Jottings – Marten’s assistant Jodie Standing specialises in Irish point-to-pointers but she will also be sharing her occasional insights. If you have bought our online version please log in to your Online Account download or view your subscriptions.